I just heard of the passing of a very special Brother and Friend, "Bazz" Childress. The South will be less strong in it's defense without this great Southron ... He could really give "those people" hell! God's speed Bazz, you will truly be missed! Y'all pray for his Family, he would do it for you. Basil Dwayne "Bazz" Childress, 55, died peacefully last night at his home in Lexington, Kentucky. Bazz was born in Cleveland, Ohio, the only child of Sid & Geneva Childress. Bazz was a collateral descendant of George C. Childress, author of the Texas Declaration of Independence. Bazz was a graduate of the University of Kentucky and a Lexington resident since 1975. 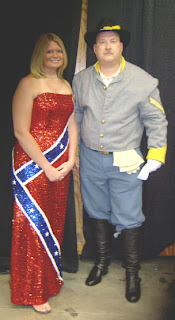 Bazz was a member of the Board of Directors of the Southern Legal Resource Center, inc since 2008, Kentucky Division Commander of the Sons of Confederate Veterans, and Kentucky Chairman of the League of the South. In 2008 during the SCV National reunion in concord, Bazz was arrested for displaying a Confederate Battle flag in his hotel room window and was arrested for criminal trespass by the hotel owner. the charges were dropped against Bazz and in 2010 he filed a malicious prosecution/breach of contract lawsuit against the Wingate/Wyndham hotel and its owner. In a display of justice typical for our day, the Judge dismissed the malicious prosecution claim, which was appealed to the Court of Appeals in Raleigh and unanimously reinstated. The case was set for mediation, discovery depositions on trial in early March. Desperate to keep Bazz away from a Nascar town, Cabarrus County jury, the Hotel filed a Summary Judgment Motion which was heard hours before Bazz should have started picking a jury. Despite overwhelming legal precedent (it had just come back from the Court of Appeals) and facts pointed out by Bazz' counsel, Judge Kevin Bridges dismissed the case again! Bazz' appeal was in process when he died. Bazz is survived by his wife Rachel, daughters Julianna and Delaney and Mother Geneva.